Last week, we also had our first summer project with Camp Peace, a program offered by the Women’s Resource Center to End Domestic Violence. Another event lead by the wonderful Mandy Goodwin, we started work on a paper mache project that we’ll finish up next week. The project entails creating a hot air balloon out of paper mache from which campers will hang positive affirmations about themselves. It’s a creative and engaging way to foster confidence and self-love in youth. For the first part of the project, our volunteers mixed paste, cut newspaper strips, and blew up balloons for all the campers. The kids then covered their balloons in around three layers of paper mache. Afterwards, we set them all out to dry so they would be ready to go for part two next week. It was a bit of a sticky mess, but the campers had a great time! For the second week, once the balloons had been given enough time to harden, students popped the deflating balloon, and were able to paint the outside of the hard shell in bright rainbow colors. We made the basket out of a cup, and wrote affirmations on strips of paper to attach to the base. It was so beautiful to see the pieces coming together, and the kids were so excited!! We joined the summer program at Clarkston Community Center again with Ellen Gadberry leading a paper making workshop. 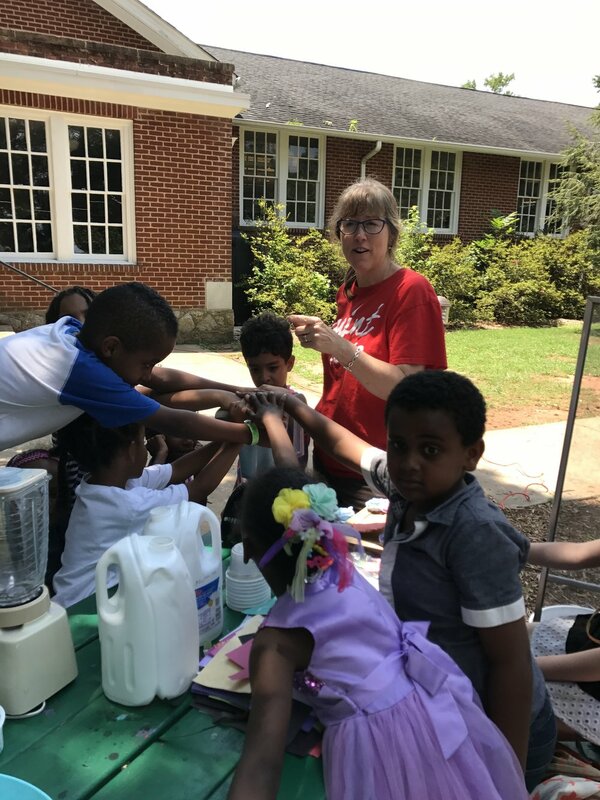 Ellen is a master of engaging kids- she read stories and then moved outside and had the kids use scraps of colorful construction paper to create their own handmade paper circles. Using blenders (which turned into a group activity in and of itself! 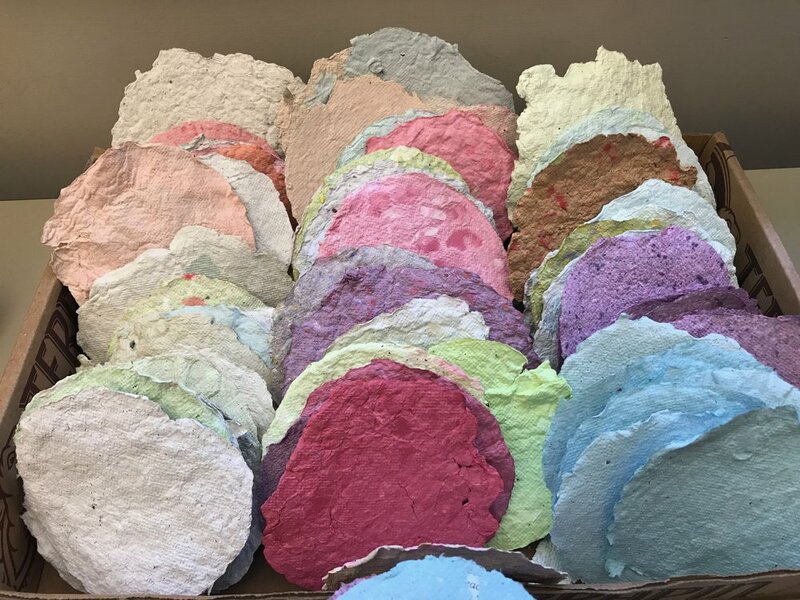 ), they blended scrap paper and used home made tools of cut yogurt cups and screens in frames to press the paper pulp into shape. Then, she taught the kids how to carefully tear and fold circles of already dry paper into perfect little roses.